In an op-ed for The New York Daily News on defeating Islamism and Muslim terrorism Senator Ted Cruz demonstrated once again why he is our preferred candidate for President. In the op-ed Senator Cruz pushed back on criticism by New York’s far-left Mayor Bill DeBlasio and soft-headed Police Commissioner Bill Bratton of his call for stepped-up law enforcement to secure Muslim neighborhoods saying, “…we must take a risk-based approach that focuses resources on the enclaves and potential hotbeds of radicalization where terrorists are likely to thrive. Just as with law enforcement’s successful efforts against gangs or drug dealers or the Mafia, we need resources and informants and undercover officers placed where terrorists are likely to be. We need lawful surveillance operations. And we need far more engagement between law enforcement and members of Muslim communities who are committed to working to rid their neighborhoods of the scourge of terrorism. Cruz pointed out that President Obama’s claims that the Islamic State “is not Islamic,” is absurd. “Everyone knows that’s nonsense. Of course, there are many peaceful Muslims in America, and hundreds of millions across the world, who can be our allies in this global battle. But we cannot fight and win without identifying and confronting the enemy. Islamism is a political and theocratic philosophy that commands its adherents to wage jihad, to murder or forcibly convert the infidels (by which they mean everyone else). 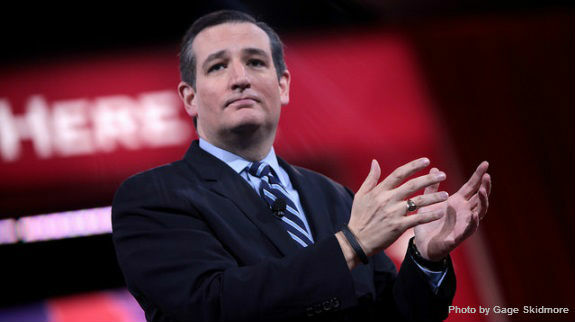 Islamism is the enemy, and it must be defeated,” said Senator Cruz. The bottom line is that to defeat radical Islam, said Senator Cruz, we need to focus our counterterrorism resources where terrorists are likely to be. “That’s not profiling or spying. It’s common sense,” noted Cruz. “An investigation of Wall Street fraud wouldn’t focus on community banks in the outer boroughs. If we want to defeat radical Islam, we need to focus on areas that are at risk of being infiltrated by jihadists. The vast majority of Muslim Americans are law-abiding citizens. Indeed, patriotic American Muslims have provided critical assistance to our law-enforcement, intelligence and military officials to detect and disrupt jihadist plots. And we need their help in the war on terrorism,” concluded the Senator from Texas. These are dangerous times. We need a commander in chief fiercely committed to defeating radical Islamic terrorism. This is a battle we must win. If we don’t want to become Europe, we need to put aside the political correctness, focus our efforts on stopping radicalization and do what needs to be done to keep America safe. Ted Cruz is the only candidate with the record and the team to get that job done.